You can cut and mill plastics, wood and wood-based materials aw well as non-ferrous metals such as aluminum. The machines are widely used for thermoforming process. 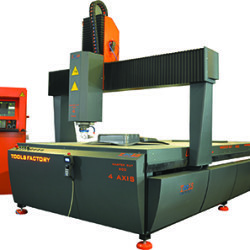 Our machinnery is offered in different sizes, various working tables, various Z clearances and it comes in many options dependin on: the type of spindle, cooling of the cutting tool, tool changer, tool length measurement. 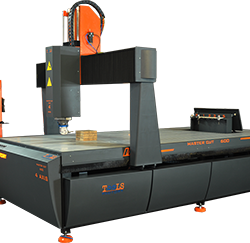 CNC milling machines have a rigid construction made of steel. Mounting elements on the working table is easy and convenient thanks to the fact that the plotter has a grooved aluminum table, or optionally a special board with mounting elements by pressure. Servo for axis X,Y,Z are used with encoders able to measure positioning with accuracy of 0.001mm. Based on this information, multi-axis controller ensures that servo error is 0. Designated Windows(TM) compatible software comes in English and Polish language versions. 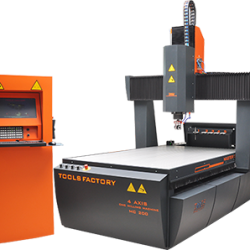 Environmental control and supervisory work of CNC MASTER CUT is universal and easy to use. The software works with a motion controller. It uses USB port for communication. This connection is fast, reliable and free of noise. The software uses the available buffer and eliminates downtime of the machine until next rules are sent. In working time the controller usually manages different options, ex. the maintenance of spindle rotation.